These ancient peoples of the American Southwest developed a complex civilization of large interrelated communities. The Anasazi evolved from nomads who lived in temporary dwellings to become accomplished farmers. 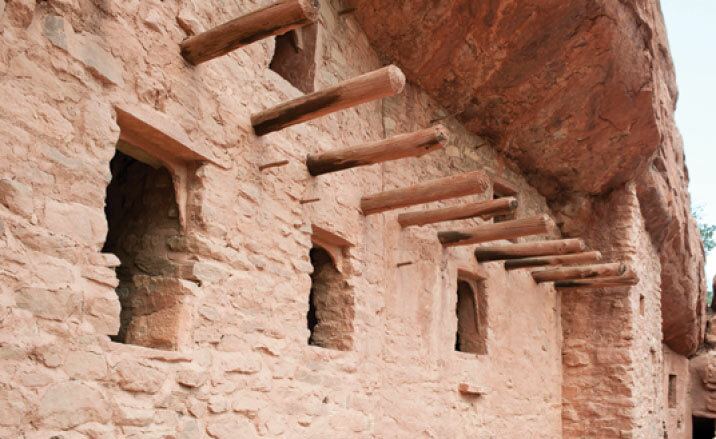 In time, they created massive, free-standing stone buildings of up to five stories and cliff dwellings like those on display at the Manitou Cliff Dwellings. From oral histories that have been handed down, generation to generation, we understand that they held the Earth as sacred and believed that all living things have a soul or spirit which is part of the Great Spirit. Unlike Europeans and their descendants, their land was not privately owned or controlled by a king. They saw themselves as caretakers of the land for the Spirit of the Earth. In appearance, these ancient people were short, stocky and big-boned. Described as long-headed, their hair was usually black, but was often brown and wavy. They started as nomadic hunter-gatherers, killing wild game with spears, gathering wild plants for food and other uses, and indulging in a little agriculture, growing mostly maize and squash.